I’m sorry for leaving you all hanging at the end of the last installment. Besides all the challenges I knew I was going to face, my company was purchased two weeks after I started my new job. So now, I work for GoPro, makers of action cameras used by surfers, skiers, and other extreme-sports enthusiasts. In the meantime, I haven’t forgotten about my Chambray Comfy shirt project. It moves along, albeit slowly because it’s been harder to find time and energy to devote to it. One perk of the job is that I am now the proud owner of a top-of-the-line GoPro Hero3+ video camera. Even before the buyout, I had been toying with the idea of doing some videos. I’m not sure the GoPro is the best thing for doing the kinds of closeups you need for instructional videos – it’s really intended for capturing expansive, wide-angle views of action sequences. But it does have a great deal of control over the types of video it can shoot, and I might try to do some “Extreme Sewing” clips with it soon. But this weekend, I finally got my second muslin finished. As you might recall, this muslin was done using the Medium version of the pattern (Kwik Sew 2000) so I could fit it against Jim and decide which version I should work from for the alterations. And since I had a good idea the pattern would end up wearable for myself, as-is, I made one of my famous “wearable muslins” – a fully finished shirt that is as much for wearing, and practicing technique, as fitting. One goal with this muslin was to try out a new placket design. 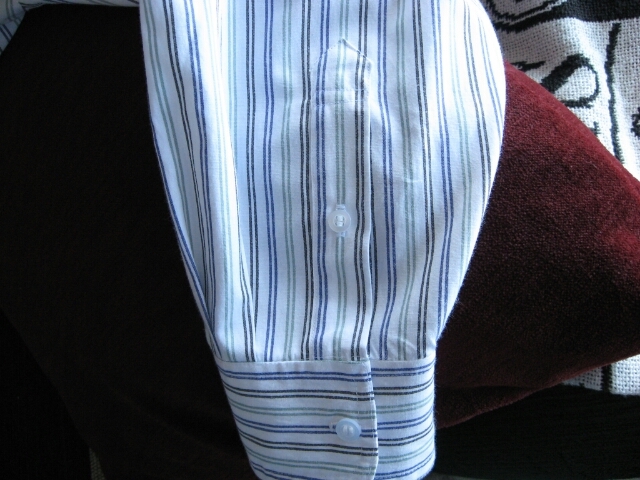 I didn’t like the sleeve placket that came with the pattern, and so used the sleeve placket pattern and construction method from David Coffin’s book, Shirtmaking. This entry was posted in Pattern Fitting, Shirts, Wovens and tagged kwik-sew-2000 on November 4, 2013 by mportuesisf.